Purchased in 1933 by (Alfred Daber, Paris); sold to Georges Renand [1879-1968], Paris. Capt. Edward H. Molyneux [1891-1974], Paris, by 1947; sold 15 August 1955 to Ailsa Mellon Bruce [1901-1969], New York; bequest 1970 to NGA. Daber and Renand according to Jean and Henry Dauberville, Bonnard, catalogue raisonné de l'oeuvre peint, Paris, 1966. Probably lent by Molyneux to the Orangerie in 1947; definitely exhibited as part of his collection at the National Gallery of Art in Washington in 1952. Purchase from Molyneux according to the Ailsa Mellon Bruce notebook now in NGA Gallery Archives (copy NGA curatorial records). Bonnard, Musée de l'Orangerie, Paris, 1947, no. 14, as Scène de famille (la famille Terrasse). Exposition Rétrospective Bonnard, Bernheim-Jeune, Paris, 1950, no. 3. 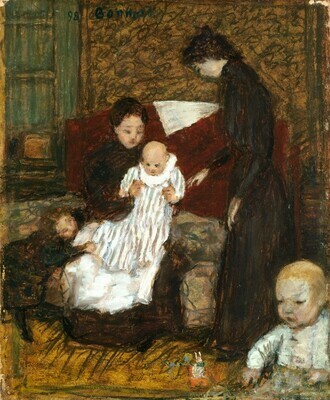 French Paintings from the Molyneux Collection, National Gallery of Art, Washington, D.C.; Museum of Modern Art, New York, 1952, unnumbered checklist, as Madame Claude Terrasse and Her Children. French Paintings of the Nineteenth Century from the Collection of Mrs. Mellon Bruce, California Palace of the Legion of Honor, San Francisco, 1961, no. 3, repro. Loan to Museum of Modern Art, New York, 1962-1965. Bonnard and His Environment, Museum of Modern Art, New York; Art Institute of Chicago; Los Angeles County Museum of Art, 1964-1965, no. 9, repro. Artists of La Revue Blanche: Bonnard, Toulouse-Lautrec, Vallotton and Vuillard, Memorial Art Gallery of the University of Rochester, 1984, no. 4. Masterpieces from the National Gallery of Art, Washington, Kyoto Municipal Museum of Art; Tokyo Metropolitan Art Museum, 1999, no. 66, repro. Beer, François-Joachim. Pierre BonnardMarseille, 1947: 52, no. 32 repro. Raynal, Maurice. History of Modern Painting. 3 vols.Geneva, 1949: 1: 103, repro. Dauberville, Jean, and Henry Dauberville. Bonnard, Catalogue raisonné de l'oeuvre peint. 4 vols. Paris, 1966-1974: no. 181, repro., as Scène de Famille. Small French Paintings from the Bequest of Ailsa Mellon Bruce. Exh. cat. National Gallery of Art, Washington, D.C., 1978: 90, repro. (continuing exhibition beginning in 1978). Walker, John. National Gallery of Art, Washington. Rev. ed. New York, 1984: 578, no. 883, color repro. European Paintings: An Illustrated Catalogue. National Gallery of Art, Washington, 1985: 53, repro.